The Lightning Lounge: Memo to Drouin: "There is More Than One Net in a Rink"
Memo to Drouin: "There is More Than One Net in a Rink"
We all know that Jonathan Drouin is not good defensively. Twitter says so. Unfortunately, things are getting worse by the day. The offense is disappearing. The defense is non-existent. 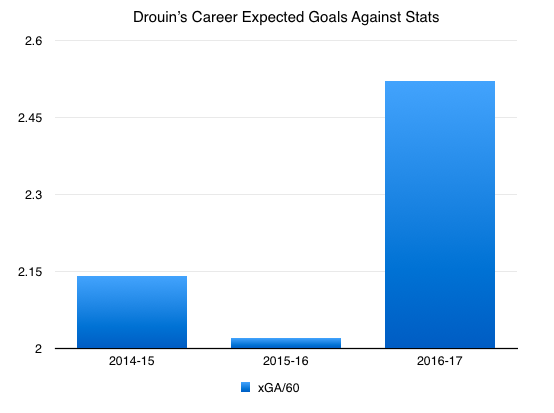 Drouin is suffering through the worst season of his young career. That's it. I said it. 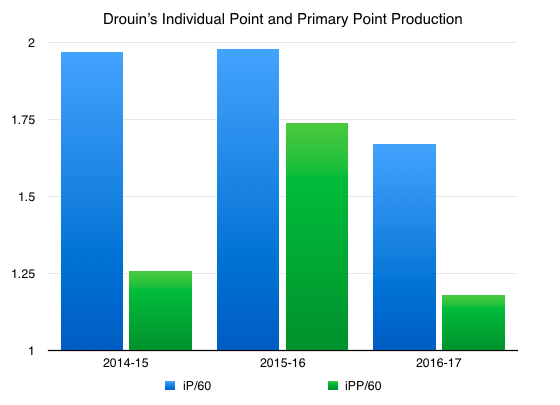 After all the talk in previous years about Drouin not understanding that there are two ends of the rink, about Drouin not being defensively aware enough, about Drouin being too flashy for his own good... After all that, this is the season that really defines it all. SIMPLIFIED: Higher green and lower blue are good. What do we see there? We see a player who is controlling less of the 5v5 shot attempt share than he did two years ago. We see a player who is allowing more shot attempts against than ever before. The flood gates are wide open, people. Get your floaties out. SIMPLIFIED: Lower blue is good. Maybe this devastating defensive play is being net out by fantastic offensive play though, right? NOPE! SIMPLIFIED: Higher blue is good. SIMPLIFIED: Higher blue and higher green are good. Where are the points? They're gone. I think Jon Cooper was right on the money last year when he made it clear that Drouin had no idea that there was a second net out there. The trouble now is that it's not that he doesn't know there's another net on the ice, folks. At this point, I'm not even convinced that he knows there's a sheet of ice at all. The bottom line: While the media elites are busy spewing alternative facts about Drouin's performance this season, the truth is that the magic breakfast meeting wasn't so magic at all. Things are worse now than ever before. Needs more seasoning. Needs to pay more dues. Needs more time on popcorn duty. With more of those three ingredients, his career may be salvageable yet. DISCLAIMER: This is not a serious blog. It was written to poke fun at the narratives that have been unfairly attached Drouin by people both within and external to the organization. Jonathan Drouin has been really, really good this year. 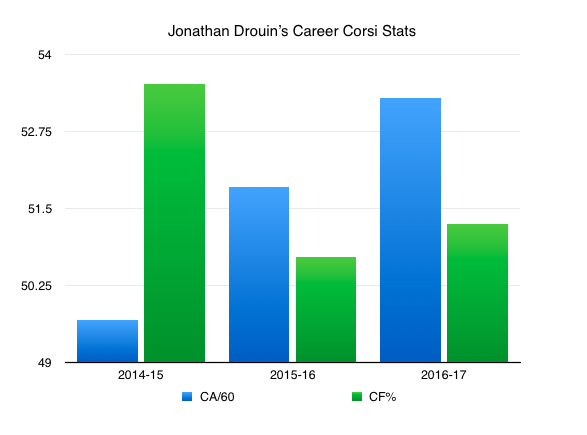 Jonathan Drouin was really, really good when he got the opportunity to play last year. Jonathan Drouin was really, really good when he took to the ice two years ago. 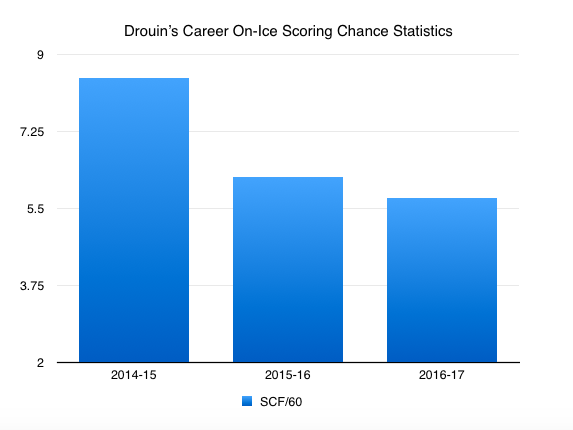 The big story this year shouldn't be that Drouin has emerged into a first-line forward (he is one); instead, the big story should be that this organization essentially wasted two years of a phenomenally talented young player. There was no magic at that breakfast meeting. There hasn't been some big change in his game that's allowed him to stick in the lineup. He's just a phenomenal talent. That's it. End of story. Keep on keepin' on, Jon. You're doing more than fine.